What are we thankful for here at Radio Drama Revival? 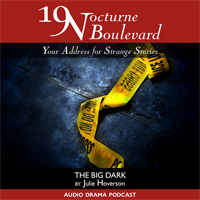 Compelling, original audio drama… like what you’re about to hear today, the latest from 19 Nocturne Boulevard. A tough southern belle dectective investigates a series of mysterious murders with her partner. But the motives of the killer and tastes of the good guys is all stranger than you’d expect in this twist on vampire mythology. I liked it. Nice story. Good acting. But the female lead? Was she attempting some sort of accent or does she have an impediment? Kind of distracting. I agree – accents can be distracting, but glad you felt like me and overall enjoyed the piece. Interesting concept and some sassy characters. Looking back, this was a real douche-y comment. My bad. I know it’s hard work putting these together. You must be a cool guy, Fred, for not jumping all over me after dropped that comment.